The Lions suffered their first whitewash for 22 years as New Zealand completed a 3-0 series win in Auckland. The All Blacks dominated again, scoring five tries through Conrad Smith, Ali Williams, Tana Umaga (2) and Rico Gear as Luke McAlister kicked 13 points. The Lions, strong up front but ponderous behind the scrum, went in 24-12 down despite Umaga's sin-binning. But the NZ captain bagged his second after the break and Gear scored late on following Lewis Moody's consolation. Sir Clive Woodward's side ended their tour with seven wins in 11 games - but lost to the NZ Maori and were well beaten in all three Tests. The 21-3 victory in Christchurch and 48-18 thumping in Wellington helped the All Blacks outscore the Lions 107 points to 40 in the series - a record total - and by 12 tries to three. New Zealand have now not lost at Eden Park since defeat to France in 1994. After an impeccably-observed minute's silence for the London bombings, the Lions actually scored first with a Stephen Jones penalty after three minutes. And matching their bright opening in the second Test, they should have opened their try account after seven minutes. A searing Josh Lewsey break down the left touchline, and a powerful run from Gethin Jenkins set up a promising position but Irish lock Donncha O'Callaghan spurned a clear four-man overlap to his right. Key battles: Who came out on top in the third Test? The Lions earned an easy three points though, kicked by Jones, after Umaga was sin-binned for deliberately lying on the ball to slow down possession. But the All Blacks immediately hit back harder as if nothing had happened. A surge from number eight Sione Lauaki fed Smith, who beat Geordan Murphy and Mark Cueto to romp home under the posts, converted by debutant McAlister, an able deputy for the injured Daniel Carter. Still depleted, the All Blacks quickly bagged another try when Lions scrum-half Dwayne Peel fumbled McAlister's grubber kick and Kiwi lock Williams pounced on the free ball. Jones snatched three points back but these were soon cancelled out after Lions' back-chat to referee Jonathan Kaplan offered the All Blacks a further 10 yards and a kickable penalty. Welshman Jones slotted another penalty on 23 minutes before the heavens opened and the Auckland sky emptied its entire contents on Eden Park. The Lions continued to attempt a wider game but their dynamism and incision behind the scrum was lacking, not for the first time this tour. The visitors did begin to build some pressure up front, and an All Blacks infringement offered Jones a penalty, which hit the posts and stayed out. The miss hurt even more minutes later, when Lewsey spilled a McAlister chip over the top and Umaga scored a stunning try under the posts after good work from the fly-half from a scrum on the right. After the interval, the All Blacks spurned a promising opportunity when Sitiveni Sivivatu failed to offload as he was bundled into touch yards from the line. 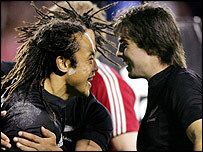 But New Zealand kept up the attack and soon worked Umaga under the posts for a fourth try. The Lions' resolve was ebbing fast, and the All Blacks thought they had scored a fifth when Sivivatu gathered lock Chris Jack's kick through. But Jerry Collins was sin-binned for an illegal tackle off the ball on Jones and the Lions earned a reprieve. The let-off gave the Lions some inspiration, and a prolonged spell camped on New Zealand's line eventually produced a try for Moody. But the Lions were battle weary, and as the game drifted to its inevitable conclusion, Gear sprang up at the death to chase a kick for an easy score. Player ratings: How did the Lions XV perform? New Zealand: Muliaina; Gear, Smith, Umaga (capt), Sivivatu; McAlister, Kelleher; Lauaki, So'oialo, Collins; Williams, Jack; Somerville, Mealamu, Woodcock. Replacements: Witcombe, Johnstone, Ryan, Holah, Marshall, Evans, Howlett. British & Irish Lions: Murphy; Cueto, Greenwood, Thomas (capt), Lewsey; S Jones, Peel; Jenkins, Byrne, White; O'Callaghan, O'Connell; Easterby, Moody, R Jones. Replacements: Bulloch, Rowntree, Corry, Williams, Dawson, O'Gara, Horgan.